Thanks for joining us at the Dark Parables The Red Riding Hood Sisters Walkthrough. Here you will find everything you need to play this exciting hidden object adventure game. Enjoy our clear instructions, custom screenshots, and solutions to all the puzzles you will encounter in the game with this complete guide. We hope you enjoy our Dark Parables The Red Riding Hood Sisters Walkthrough. In Dark Parables The Red Riding Hood Sisters, you'll once again play the role of the fabled detective in what could be your most challenging case yet! Your opponent, the evil Wolf Queen has trapped the order sworn to fight these dark and dangerous wolves, the Red Riding Hood Sisters, and now, it's up to you to help them before the Wolf Queen unleashes her legions of ravaging wolves on the world! Magnifying Glass Icon - When your cursor turns into a magnifying glass, it means you can zoom in on an area and get a closer look. Hand Cursor - When your cursor turns into a hand, it means you can pick up an item or interact with it in some way. Hints - Hints can be found in lower left hand corner. Click on it if you're stuck and need some help. Inventory - Your inventory can be found at the bottom of the screen. Click on an item to use it. Difficulty Settings - There are three difficulty settings in this game, casual, normal, and hard. You can change the difficulty settings during gameplay by clicking on the options button in the lower right hand corner. Map- The map will tell you where you are. Click on it in the bottom right hand corner of your screen to see a more detailed view. Sparkle Areas - Areas that sparkle can indicate a hidden object scene or a puzzle area. Click on the area to start it. Task Button - Click on the task button in the lower left to see the lists of tasks that you need to perform to move on in the game. Chat Bubble - When your cursor turns into a chat bubble, it means you can talk to a character in the game. Just click on them to start the conversation. Skip - During mini-games, if you are having trouble or maybe you just don't feel like solving it, you can click on the skip button located near the bottom of your screen. And that's the basics for playing Dark Parables The Red Riding Hood Sisters! Good luck! 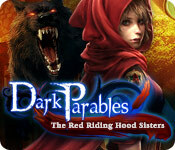 And we hope you enjoy our Dark Parables The Red Riding Hood Sisters Walkthrough! Good luck!